What is it really like to travel and live on an island? 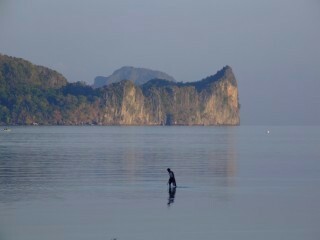 Walking on water in El Nido, Palawan. by Dave from The Longest Way Home ~ October 22nd, 2009. Updated on February 9th, 2011. Published in: Travel blog » How to live overseas » Philippines. 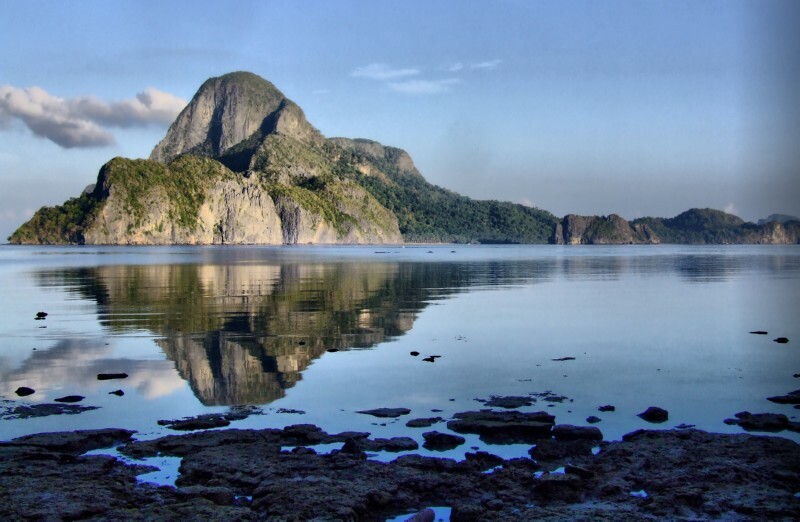 El Nido is beautiful, of that there is no doubt. I will take that back once the developers arrive. And from what I hear, they are on the way. I continue to write, and I get a lot done. But, I am feeling pressured. The weight of 4 + years of searching is bearing down, or is it that there is so little distraction around me. It’s not home. Then why am I staying here? Ah, to prove a point about living on an island. Keep in mind the above is not a ‘travel budget’ but a living on an island budget. That’s it. But, there are hidden costs. Visas. Travel to Puerto to get visas. Internet costs and the occasional soft drink, coffee to stay in touch with today’s world at a local cafe. Occasionally I look up and out of my window to see a miracle. A man walking on water. He is actually walking on water. But one inch below the water is a coral and rock plateau. He’s not just doing this to impress the strange foreigner who keeps pointing a camera at him every evening. Throughout the whole area are small sea urchins and other shell-fish that the man is searching for. He’s living off the sea. A nightly walk can bring back some side dishes to break the monotony of rice. Or quite simply to feed his family. This man walks on water every night. I don’t know what he does during the day. But as dusk approaches he is always there. It was when I was watching him one night that two worlds collided. Is living on an island a fantasy? or can it be a reality? I remembered back to my 48 hour Pakistan train journey with the good Colonel. We stopped over the Hindus river and he pontificated that the local man serving curry at the station knew no more than to make curry and serve it. Therefore he was a happy man. And it was a good life. I disagreed at the time. If the man knew about the outside world, maybe he’d fight tooth and nail to get to it. Africa taught me that. It’s a hard concept for someone bombarded with internet, TV, media and a deluge of culturally diverse people to understand. There are some people out there who’ve never been in that environment. The words 24, Beyonce, Oscars, interest rates, economic collapse mean nothing to them. “It’s a simple life that brings peace to your life,” the colonel said. I didn’t get it at the time. And even now, I know that I don’t actually want it. But, I do feel it. Perhaps I understand it now. I decided one evening to try this walking on water thing myself. It gets strange the further out you get. Turn around, and the shore is really quite far away. Just sea separating you from all sides. I didn’t go looking for shellfish. But, I did walk on water; and I knew what it meant. This was a really beautifully written post. That is a question I have pondered myself… Would I be happier wanting less? Not knowing about so much? Living a simpler life? Or would I still crave what I do not have? Perhaps learning to be content with what you have, regardless of where you are is the important thing… I can only imagine the sensation of being so far from shore in the middle of the ocean. Amazing. -Rose- Thanks for your kind words Rose. Yes it is one of those pondering questions. A friend of mine said to me “that’s why children are always happy, they don’t know so much” Then we grow up :) Personally I don’t like the word content it makes me think of settling for something rather than trying to achieve something of the original goal. But then that’s just my take on the meaning of the word. There’s another side to the coin too. If we choose to switch off and not achieve, are we failing ourselves? A catch 22. Then again, over analyzing is never a good thing either! -Tim- Hi Tim, thanks for your first comment! Indeed it is subjective, as is this journal. It’s a journal about my journey. So in turn it’s my experiences, which not everyone will agree with, nor relate too. And this of course makes the world a more interesting place. One of the biggest mistakes I see expats do in the Philippines, is not having a productive hobby or routine. Even with oodles of cash, diving, partying, beaching, trekking and whittling away the days can become monotonous. Either way I certainly wish you the very best on your move to The Philippines and hope to see you back here too! -jessiev- Hi Jessie, good to see you again. Thanks for those flattering comments, I’m glad you liked the article :) It’s certainly something I enjoyed writing as this topics been on my mind for a while. I’ve been reading your posts about the Philippines since you arrived but this is my first comment. Your contention that life on an island is boring certainly has merit, but it is very subjective. The constant onslaught of information (most of it useless or deceptive) in the West is wearing me down. I will be calling the Philippines home soon and testing out your postulation in real time. Even though I’ve not spent more than a month at a time there during several trips I’m confident the lifestyle suits me. Perhaps my confidence comes because I will be able to live on more than a few pesos a day. Being poor is no fun regardless where in the world you are. incredible article. this is one of my favorites of yours, to be sure. the clarity of thinking that comes when you’re immersed in other cultures is truly something. excellent food for thought! (and photos). You are so right about hobbies and/or other interests. I think I’ll be ok.
My first comment on your blog may seem negative which is unfortunate. The reality is that I’ve enjoyed your musings very much and have found them thought provoking and refreshing. The photos are awesome. Thanks for sharing! -Tim- You’re always welcome to comment here. Hope there’s something now, or in the future on the site that might help you out on your own journey. Thanks for the kind words and best of luck with the move! That’s a beautiful post, my friend. Voluntary simplicity is certainly a challenge in the consumerist “west” and I have always been drawn to island life. If I didn’t live in the Prairies, I would live on an island. And whether you have a lot or a little, the challenge is, indeed, contentment. One only has to look at the high rates of depression and suicide, even among the wealthy, to realize that it isn’t all what you know. -Kirstin- I liked Manila too! One of the few that does I think! But know what you mean. Thanks for checking the site out. -Melissa- Thanks so much for those kind words about the blog. I’m glad you to see the true wonder of untouched happiness through the smiles and faces of people. Outside of the tourist routes this is where you will meet real people who actually bring a smile to your face as well. Many people miss out on this when they travel. Which might just be a good thing. As usually once this is discovered, the massive buses soon follow. Glad to hear you are going to visit a few of these places soon! Ace post! I’ve been to Palawan myself but unlike you, I’ve had the convenience of living in Manila for most of my life. Great to have you in our country. This comment is being written with envy as I type away from my desk in the City. Keep safe and happy traveling! Beautiful Post. Simplicity and happiness. I’m new to reading your blog so thanks for the inspiration in depicting mankind, the cultures and the earth as you do. I’ve travelled a little myself and it is remarkable when visiting countries and places like in Africa, and you see the smile on the faces of kids, teenagers, and adults – unrelated to anything but true happiness. They have nothing (to those that define ‘stuff’ through a monetary sense) but embody more happiness and peace than most people (who define life by what they do or the stuff they have) will ever feel. It is the simplistic, magical nature of the meaning of life. I will be in Bohol, Cebu, Palawan, and Boracay soon…. as well as other SE Asia counties… I am ready to walk on water…. Be safe. God Speed.